Roselia - The Everlasting Guilty Crown · forums · community | osu! Last edited by Underdogs November 8, 2017 at 5:24:36 AM GMT , edited 35 times in total. 00:40:431 (3,4) - looks a bit too cramped compared to similar patterns. maybe move 00:41:129 (4) - to bit down. 01:57:175 (1) - x0.75 dosent good work here imo. try x0.85. 02:03:885 - bit noisy to me. mayebe 5%? finish point is 02:09:782 - only this diff. in the thread I linked, we found official sources (that you can copy-paste directly), as well as confirmation from kwan. I don't see why you wouldn't want to change it. Discussed with nitrous. This song is the one of the game's content, so it is right for me to put the current source. The same goes to toaru_fict taiko set (although the change is not necessary since adding the romanized to the taggs would solve the problem in ultimate). Keep in Mind this is easy diff not normal! 00:19:326 (6,1) - little bit weird distance changing following hitsound piano which decrease. 02:06:507 - hmm spinner more suit here i guess nope. The last spinner fits fine. 00:07:640 - I think there is a rather pronounced sound on the white tick here, wouldn't it be more intuitive to play if it was clickable? shorten the slider by 1/4 and make a triple with 00:07:727 (2,1) ? 00:08:337 (1,2,3,4) - remove 2's overlap with 00:07:989 (2) ? 00:36:594 (2) - as of now the flow with 00:36:245 (1) feels very out of place imo, you could fix things like this? 00:38:163 (4,5,1) - move this down so it would flow better with 00:37:989 (3) and move 00:38:687 (3) to the right to avoid overlap? 00:39:733 (1) - rotate this counterclockwise and ctrl+g? 01:52:117 (2) - this feels weird, you could even do something like this to create some sort of back-and-forth. 00:05:198 (5) - place it somewhere like (480,190)? 00:07:989 (4) - place it somewhere like (50,250)? in this way it creates proper emphasis for 4 and a better flow imo. 00:09:908 (2) - this is an insane diff so it could and should be two circles imo, it feels much better to make the downbeat (snare) clickable like this. 00:10:431 (3) - i noticed that the same part of the music is a pause only here and it is not everywhere else, making it inconsistent as of now. personally i think making every one of them a pause reflects the music better, and i think that's an easy fix to do if you turn each slider into two circles as i explained above. some of them would need a bit more re-positioning tho. 00:34:501 (4,5,1) - there is no reason for these to be anti-jumps? 00:36:245 (1,2,3,4,1,2,3,4) - i think it's better to discard this design and map the rhythm according to the piano hitsounds, there is nothing in the music that suggests this. 00:46:361 (2) - ctrl g? 00:48:105 (3) - make this parallel with 00:48:454 (4) for a better flow? 01:06:419 (4) - ctrl g? 01:11:826 (3,4) - ctrl g each of them? 01:20:896 (1,2,3,4,5) - you could make all of these as jumps since it better reflects the music and you can do it in an insane diff. also more pp but lol. or more easily you could do the thing you did for 01:32:059 (1,2,3,4,5,6) for more consistency throughout the map. 01:54:559 - this might be better as a circle? 00:51:245 (5) - it doesn't make sense to make the snare not clickable. a relatively big jump for 00:51:419 would reflect the music better. in general the rhythm before the kiai seems to be very confused throughout the section, it's not clear whether you're mapping to the instruments or the vocals. i would personally prefer mapping to the vocals in a hard diff, but if the rhythm could revolve more tightly around either the instruments or the vocals throughout it could be a much more fun map. everything during and after the kiai seems mostly fine though, couldn't you try the thing you did there for everything else? i hope you rank the set, the hitsounds are too good to be wasted. 00:48:105 (3) - make this parallel with 00:48:454 (4) for a better flow? isn't it already parallel? 00:11:129 (1,2,3,4) - , 00:19:501 (1,2,3,4) - , 00:26:129 (1,2,3,4) - , and 00:27:873 (1,2,3,4) - all look out of proportion. Especially 00:27:873 (1,2,3,4) - with the differentiating DS. 00:37:640 (1) - You suddenly stop mapping the increase in pitch, why is that? 00:41:129 - Similar issue, only you stopped mapping the decrease in pitch. 00:42:524 (3) - Wouldn't this be a slider if you were follow vocals? 01:20:024 (4,5,6) - Not very consistent with the triples, which makes them kind of just... "there." I urge that you make them consistent to a pattern with the exception of vocals, otherwise remove them. 01:28:396 (4) - Wouldn't this be extended along the vocals? You've done it for similar parts of the song, why not this one specifically? 01:29:966 (4) - This 1/1 slider feels out of place in terms of vocal focus, usually because you used them at the near end of the measure, not at the near beginning of one. 01:53:338 (3,4) - Wouldn't these two notes be one slider, if you were to keep consistency with 01:50:547 (3) - ? 01:53:861 (6,7) - Weird arrangement of rhythm here. Most likely due to 01:54:036 - ending on a snare without enough emphasis. Few inconsistencies, some awkward stuff. Other than that, it's a solid map. 00:10:431 (3,4,5,6) - Concerning this and all the similar patterns, you didn't really use consistent DS in these, which make them all look weird. Maybe make the DS consistent between all of them? 00:30:663 - Even though they're different verses, they're still pretty similar in rhythm, so why should the pattern be any different, compared to 00:41:826 (1,2,3,4,1,2,3,4) - ? 01:37:639 (8) - I say NC it. Even though you can start it 01:37:989 - , 01:37:639 (8) - still starts a new measure. Nothing much to poke at other than the aesthetics. 00:13:047 - You missed vocals here. Its fine to map the piano too when you're focusing on vocals, but in this case you missed the vocals for the piano, which isn't very consistent. 00:24:210 - Similar to the situation before. I really urge you map these. Aside from a few pokes, hard is looking good. 00:13:047 - You missed vocals here. Its fine to map the piano too when you're focusing on vocals, but in this case you missed the vocals for the piano, which isn't very consistent. Don't want to map the vocals too much. I mean I'm focusing the vocals, but I discarded so much piano for it. 00:23:687 (1,2) - move note 1 to the place around 00:22:815 (4) - . you've set aiming pause at common piano track patterns like 00:17:233 (4,1) - with shorter distance, you can do that here as well even with that longer gap, too. also if you change this, arrange 00:23:861 (2) - 's position later. similar thing to 00:28:396 (4,1) - . 00:43:222 (1) - recommend you do ctrl+g. this is a quiet part and don't need that big jump + anti-flow, also parallel movements at 00:43:222 (1,2) - after you change it is also gentle. 01:01:361 (1) - still recommend you do ctrl+g to this. seems like you wanna emphasize this beat so badly that even give that anti-jump at 01:01:187 (7,1) - , thou i think vocal at 01:01:361 (1) - is general and doesn't deserve a so strong change. for you've already set much big jumps at previous part, do that reverse can make 01:01:361 (1,2) - 's jump larger but still acceptable with fluent flow. 01:06:070 (3) - move control point at the middle to 138,312. do that to make that slider overlap the common flow while you don't need something heated to stack your aiming there: this part is quiet as well. 01:21:943 (4) - replace this with two notes and jumps. these piano beats are so special that you can't really ignore any of them, give a jump with two notes here can be better done. 01:33:454 (1,2,3,1,2,3) - merge those 1,2 notes to 1/2 sliders. like an opposite example of the mod above, maybe you wanna follow basic rhythm with drum track, but at least you can set tap ticks by other obvious and strong track, like that piano one. sliders express emotions clearer than notes with just common hit snare and kick, you can even give big jumps among those sliders. similar things to 01:39:384 (2,3,4,5,6) - as well. 01:59:094 (2,3,4) - change this stream with straight flow overlapped after 01:58:919 (1) - ? this right angle movement with big jump is not that necessary imo, at least that distance of jump can be decreased a bit. most part used fluent flow but changed into anti ones at unexpected point, i think you can just do that at downbeat or special/strong beats only. other parts are fine to me. 00:10:431 (3,4,5,6,1) - arrange these notes into a fluent curved line? current setting seems not perfect, the idea is ok and maybe you wanna do that trick with proper distance values. i just need to say that you can do that better, like 00:13:222 (3,4,5,6,1) - is just good to me. similar things to 00:18:803 (3,4,5,6,1) - as well. 00:30:663 (1,2) - for this is an insane level diff and you maybe just wanna be some common insane map as well, this distance is like a bit tricky due to those 1/2 jumps are already 1.5x large, which means you should even give much than that to 1/1 gap jumps to notice players by straight forward placements which can be read without much pressure. maybe just drag 00:30:663 (1) - 's tail point to 362,376 with flow kept here. and this is also a general mod to the whole diff, something like 00:32:059 (4,5) - or others are all considerable. 00:37:640 (1) - how about just reverse this? (ctrl+g) flow can be without fold line and for somehow sense the pitch of string track's beats are higher than previous ones. 01:16:536 (4,1) - maybe decrease distance of jump here. this jump is too large that compared to other similar part in the song's pattern like 01:19:326 (4,1) - or 01:27:524 (4,1) - . well, if you still wanna keep it to give large jump, you'd better do same things to later ones as well to keep them in consistent style setting. 01:33:454 (1,2,3,4,5,6) - similar advise to Gaia's Extra's mods as well. also 01:34:850 (1,2,3,4,5,6) - , too. but maybe you just wanna give a proper notes pattern with double triangles, i prefer rhythm's first thou... same to other piano solo's strong part. 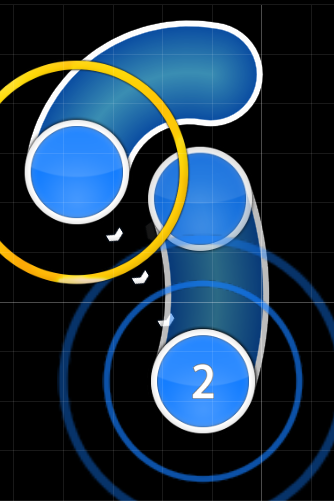 insane level maps can also easily express music's different tracks by rhythm and distance, maybe not just focus on basement. the map itself is fine. 00:43:919 (6,1) - i highly recommend you not give ds patterns like this in a hard diff. you may not do distance snap in hard diff cuz you don't need to, but when larger gap comes, things may change a bit: 1/1 and 1/2 can be confusing to medium level players as well. this will plays really awkward when they have all around 1.4x jumps before, and suddenly met a 1.0x 1/1 gap's jump, like a pause in aiming. just increase distance here and make sure 1/1 jumps are well distinguished to 1/2 ones. same things to other parts, too, like 01:20:547 (8,1) - here you can just do ctrl+g to 01:20:896 (1) - and solve everything. 01:37:640 (8,1) - swap nc? didn't see special reason you need to delay nc setting here. 01:55:082 (3,4) - spread them? clearly piano beats here are consistent and stack may not express that very well. just move 01:55:257 (4) - to 41,41. 01:59:268 (1,1) - remove these nc? seems like you wanna notice players that ending is coming which may give some bpm changing, thou they are really not come before those slow sliders appeared like 01:59:966 (1) - which really noticed the song's already shifted from heated kiai to quiet part. i love free distance, but i still wanna see no ds trick in lower diffs. btw, 01:13:919 (1,1) - here because of that gap is large enough to let the object disappear before the next one appears, any place can be fine if you set rhythm style like that. 00:39:036 (5) - this deserve a nc. thou this is a quiet part with long sliders, for in same section and you've set nc at 00:33:454 (1) - , short combo is not a good reason that you give this part's objects more special. same advise to 00:50:198 (6) - , too. 00:51:419 (1) - remove nc. as the mod mentioned above, if you wanna keep your current nc style then so be it. otherwise, this is really unnecessary since the combo after that is really short before next downbeat comes. 00:55:780 (4) - this deserve a nc, too. here's already a heated part and for newbies cutting combos with nc is some kind of important imo. same thing to 01:50:198 (4) - as well. 02:02:035 (1,2) - highly recommend you just use absolute distance than calculated distance. you know timing and inherited lines may change distances' counting way, so that number at top-right corner expressing distance is a final result after considering timing (bpm) and inherited (multiplier) setting. but as you've seen that distance is clearly different from common ones before. for this is a lower diff and mainly for newbie players playing, here i just recommend you give an absolute distance for that jump: that calculated number should be around 2.0x, you are free to give the place whatever you want. 00:27:873 (5) - simply add nc here? obviously this is a downbeat tick even with spinner after it. 00:32:059 (1) - and this nc is not necessary. combos are not that long as well even you remove it imo. 01:23:687 (1,2) - even this is ok to the bottom diff, gaps around objs with shifts are still tricky to newbies, better change it. 3/2 reverse slider is a good way, like you did before. similar to other same patterns, too. 01:36:245 (3) - add nc. i'm like understand those nc spam before this, so here this one deserve a nc as well. 01:37:640 (5,1) - swap nc. i don't think here something has special reason to delay that nc setting. same to 01:48:803 (3,1) - , too. 01:41:826 (1) - remove nc. nc setting from 01:37:640 (5) - shall set every 8/1 gap like you did to the rest, not necessary to give an additional one there. 01:51:594 (4) - add nc. well, that combo is long enough to break it. hmm... i highly recommend you that just do common nc setting to lower diffs. basic track is better than other special tricks in other tracks for newbies to catch. i see you wanna give nc to let combo started at some special track's beats, but that's really not a good choice. i think i've heard this song's original version somewhere else... thou still don't know where. felt like it was patterned with enough emphasis, given the fact of that part's flow is a bit wonky. 00:37:640 (1) - how about just reverse this? (ctrl+g) flow can be without fold line and for somehow sense the pitch of string track's beats are higher than previous ones. Can't agree with that. Even though it is a repetitive string of instruments, changing the slider head's starting position doesn't tick right for me. 01:16:536 (4,1) - maybe decrease distance of jump here. this jump is too large that compared to other similar part in the song's pattern like 01:19:326 (4,1) - or 01:27:524 (4,1) - . well, if you still wanna keep it to give large jump, you'd better do same things to later ones as well to keep them in consistent style setting. I increased some of the jumps. But no changes to jumps like 01:19:326 (4,1) - as i prioritized vocals. And when the pitching is lowered, so as the spacing. 00:43:919 (6,1) - i highly recommend you not give ds patterns like this in a hard diff. you may not do distance snap in hard diff cuz you don't need to, but when larger gap comes, things may change a bit: 1/1 and 1/2 can be confusing to medium level players as well. this will plays really awkward when they have all around 1.4x jumps before, and suddenly met a 1.0x 1/1 gap's jump, like a pause in aiming. just increase distance here and make sure 1/1 jumps are well distinguished to 1/2 ones. same things to other parts, too, like 01:20:547 (8,1) - here you can just do ctrl+g to 01:20:896 (1) - and solve everything. fixed?